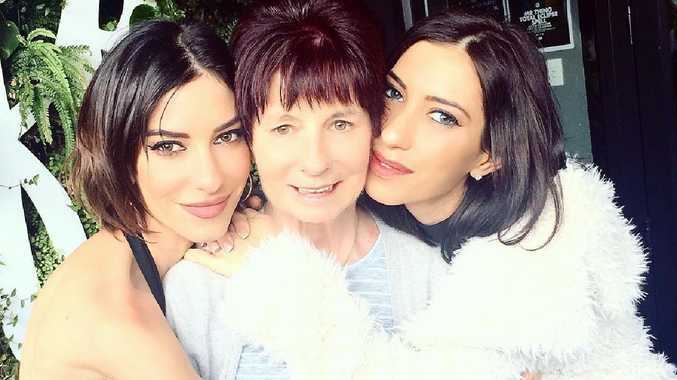 LISA Origliasso has shared the first official snap from her Sunshine Coast hinterland wedding. The Brisbane singer, who performs alongside twin sister Jessica as The Veronicas, tied the knot with American actor Logan Huffman at the weekend. Origliasso and Vogue Brides Australia took to social media today to share a black and white image by photographer Joey Willis of the couple sharing a kiss after saying "I do" at Montville venue Secrets on the Lake on Sunday. "This past weekend I got to marry the man of my dreams. In the dress of my dreams," she wrote alongside the photograph on Instagram. The 33-year-old, who dubbed it "the most magical" time of her life, shared the details of the big day with Vogue, telling the publication the venue was one she had loved since childhood. Origliasso told Vogue Brides Australia she enlisted the help of her stylist Fleur Egan and wore a J'Aton creation, drawing inspiration the wedding day look of Wallis Simpson, an American actor who married King Edward VIII. "We loved the idea of my waist being the focus and decided we wanted the dress to have a shape that was timeless and structured without embellishments," she told the publication. "The high-framed neckline, stitching on the corset, belted waist, long elegant train and smocking on the skirt were details imagined by J'Aton that perfectly embodied my style and fit in beautifully with our accessories." Vogue Brides Australia also revealed she wore vintage leather gloves, Charlotte Olympia shoes, an Elizabethan era-inspired headpiece and carried a small bouquet of lily of the valley wrapped with her family's rosary. Origliasso told the publication Jessica had acted as a bridesmaid and her hair was by Darcy Stratford, make-up by Noni Smith and the wedding was planned with the help of Zak Eagleton and Tanya Rose. Origliasso and Huffman have dated since 2014.